"A quick, simple and delicious no-fail fish recipe. 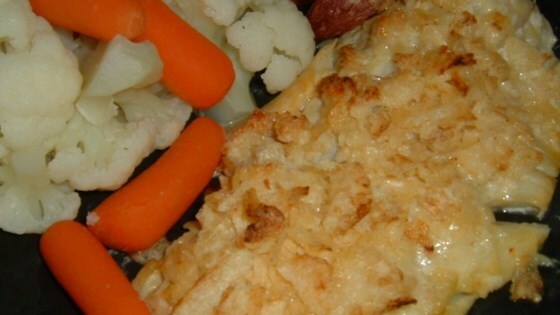 You can use any firm white fish fillets for this recipes such as scrod, walleye, or halibut." Preheat oven to 500 degrees F (260 degrees C). Coat a 9x13 inch baking dish with non-stick cooking spray. In a medium bowl, marinate the fish fillets in the salad dressing for a few minutes. Toss the shredded cheese and crushed chips together. Place the marinated fish fillets in the prepared baking dish and top with the cheese/chip mixture. Discard the leftover marinade. Bake, uncovered in the preheated oven for 8 to 10 minutes or until the fish can be flaked with a fork. Not a bad recipe for those who really don't like fish. The flavor of the fish is lost in all the stuff you did to it. Maybe some like that, but I'll never make this again. This is a delicious TASTING recipe. This was so quick and easy to make, I love it. I didn't have any creamy Italian dressing so I used regular Italian dressing and it turned out delicious.